Secure your company’s assets by installing a security camera system for your Houston based business. Imagine this: You lost important documents from your office and you suspect they were stolen by your employee the day you were absent, but there’s no proof of anyone goin g into your office except your suspicious mind. Would you install a card entry security system to help control employees access from entering your office? As a business owner are you prepared to face lawsuits? An employee has the right to sue your company for several reasons. Would you do anything to avoid the mental stress of a lawsuit? What if an employee sued your company for their injured leg, but injured their leg elsewhere and are now accusing your company for the wrong reasons? In order to have honest proof of the situation mentioned it is important for your company to enhance their security systems, not by simply giving workers the proper safety attire and equipment, but by installing security cameras to protect your company’s name. Installing a security system will give you peace of mind, knowing that your business is being monitored both while you’re there and while you’re gone. Have you noticed a shortage of supplies in your office? Security cameras can help you identify employees who are stealing or even damaging your business equipment. If you ever find yourself in a situation where someone outside of your business is trying to harm your employees, a security camera will be able to capture evidence of the crime scene. In a time like this, it is hard for employees to collect or recall information from the rapid incident. 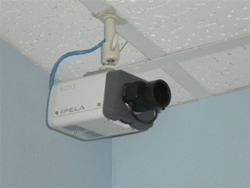 A video tape from a security camera can provide more accurate information than an eyewitness. Are your employees faithful when you’re out of sight? As a business owner you won’t need to worry about supervising your employees to make sure they’re working effectively. With a security system you will be able to monitor their work at your convenience. Security cameras can also help you identify the dedicated employees for when you’ll give bonuses. Also, if your business starts lacking growth in a certain area, you will be able to dismiss employees that are preventing advancement in your business. Our company, Highlights Electrical, provides top quality customer service. We offer monitoring and recording equipment to facility managers and business owners. For more information about our services or to schedule a security system installment do not hesitate to call us at 713-266-6464. Installing a security camera system for your Houston based business will protect you, as well as your business’s assets and employees. This entry was posted in Uncategorized and tagged houston, Security Camera, Security System on January 26, 2016 by writer. Look at the light in the building you’re sitting in, the technology you’re using, the television you’re watching, or theoutdoor street lamp–you are probably being illuminated by Light Emitting Diodes (LEDs) without knowing it! Highlights Electrical offers LED lighting in Houston to help you save money. The Reason For its Popularity? LED bulbs help save money! Users of LED only worry about changing light bulbs approximately 50,000 hours (which beats any standard light bulb). LED lighting is replacing old-fashioned bulbs because it is the most energy efficient light source. LED’s don’t work quite like old fashioned light bulbs, a Diode is the element that differs LED’s production of light from traditional incandescent lighting, which uses a filament. When the electric current passes through the diode, it creates a high energy level that produces light when released. What Are The Benefits of Using LED? How Do I Switch To LED Lighting? Highlights Electrical offers LED lighting in Houston since 1986! We ensure that our clients receive the most out of their electricity services; therefore, we offer low installation and service cost. To start discussing a plan, contact us at 713-266-6464. We assure you that your transition to LED lighting will be as smooth as possible. This entry was posted in Lighting Systems and tagged energy efficient, houston, LED, led lighting on December 10, 2015 by writer. Does LED Lighting Work in Freezing Temperatures? Houston is known for its sweltering summers, but we have been blessed with relatively mild winters. 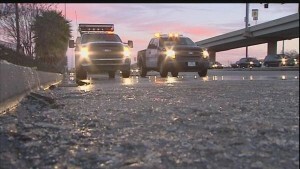 Although it doesn’t happen too often, even Houston can get hit with a major freeze, like the one that happened last week. When that low pressure systems comes in, you want to know that your business can handle the cold just as well as it can handle the heat. Over the years, we have gotten a lot of questions concerning the the effects that freezing temperatures have on the performance of several lighting systems, particularly LED lighting. We thought it would be helpful to answer those questions here! How Do LED Lighting Systems Perform in Freezing Weather? LED lighting systems are actually the preferred lighting option for cold environments (to around 20 degrees). The work well with both interior and exterior fixtures. Unlike CFLs, LED lights have no problem starting up in temperatures about 20 degrees, making them perfect for Houston business fronts and parking garages. Also, because LED lights contain no glass components, they are more able to withstand extreme sudden temperature changes. They are durable and perfect for outdoor applications. Do LED Lights Use More Energy in Freezing Temperatures? Contrary to popular belief, light bulbs do not require more energy to operate in freezing temperatures; this includes LED lights. In general, LED lights use less energy than other lighting systems. Most light bulbs lose most of their energy through heat energy: incandescent bulbs give off 90 percent of their energy as heat, while compact fluorescent bulbs waste 80 percent as heat. LED lights on the other hand, remain cool no matter what the temperature and emit light in a specific direction, thereby conserving energy throughout its lifespan. What out though! LED lights that are not Energy-Star certified are not as energy efficient as those who are certified. If you are looking to install a new lighting system or retrofit your existing system to accommodate LED lighting, please contact the electrical team at Highlights Electric. Not only can we help your business be better equipped for the next freeze, but we can also help save you money by choosing energy efficient systems and helping you apply to rebate programs. Call (713) 266-6464 today! This entry was posted in Lighting Retrofits, Lighting Systems and tagged energy efficient, energy star, go green, houston freeze, LED, led lighting, winter on January 27, 2014 by writer. Keeping your office building or complex safe is a must in today’s society. The easiest and most efficient way to ensure your property stays safe is by installing an electrical security systems. Highlights Electrical in Houston offers an assortment of modern security products. Card access systems for buildings is a safe way to ensure that not just anyone can walk off of the street and into your property; only trusted employees can gain access. There’s also an option to set different security levels to manage the access of different areas. 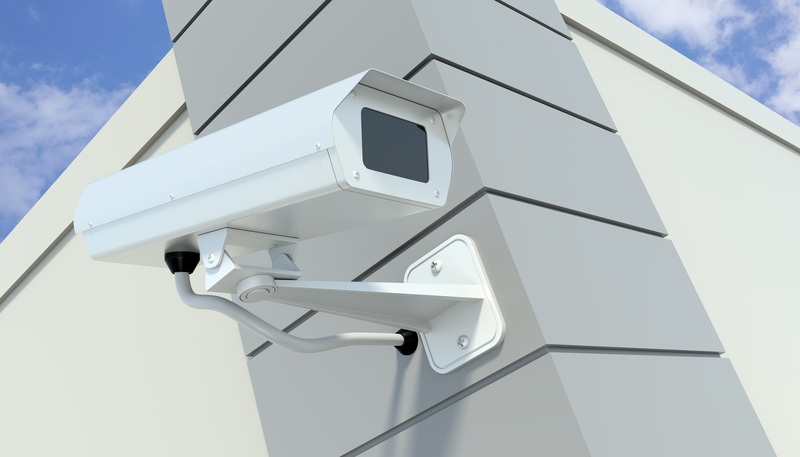 Installing a video camera monitoring system is the best way to not only see what is happening on on perimeter of the building but also what is happening on the inside. Monitor employee activity and external activity in the parking lots, adjacent roads, etc. It couldn’t be easier to monitor and protect your property–Highlights Electrical even offers software to manage these security systems online. Plus, camera monitoring and card access systems are just two of the many security options available. As electronic equipment develops, security systems become more and more sophisticated. There’s a variety of options to safeguard your building. Contact Highlights Electrical today to learn about these and other options to security systems in Houston. This entry was posted in Uncategorized on November 22, 2013 by writer. Recently a prospective client asked, “What sets Highlights Electrical apart from other Houston commercial electrical construction companies?” The first answer that came to mind also happened to be the best answer: our dedication to quality it unparalleled. What does that statement actually mean though? Let’s think about it a bit. Deadlines are extremely important in construction. Most projects often suffer from unexpected, lengthy delays. We work with clients and general contractors to set realistic and reasonable deadlines for our portion of the project. While we cannot predict the weather or delays in other aspects of construction, we can communicate openly with the client and make sure to keep them in the loop whenever there may be a potential delay. We implement effective communication efforts with all of our clients. Electrical construction works in conjunction with structural construction. We work closely with general contractors and architects to ensure that we design and install the proper electrical system the first time around. The technicians at Highlights Electrical has completed electrical construction for a variety of commercial facilities, including — but not limited to — office buildings, shopping centers, retail facilities, restaurants, parking garages, and many other venues. Once our systems have been installed, we thoroughly test them to make sure that they are working properly. Our extensive troubleshooting practices guarantee that your electrical system will work and run exactly as you had envisioned it. Moreover, we offer regular maintenance services so that your electrical system will keep running smoothly. This service also helps us isolate potential weaknesses in the system before a problem arises. For quality commercial electrical construction in Houston, there is no team more well-equipped than the technicians at Highlights Electrical. Give us a call at (713) 266-6464 or shoot us an email. This entry was posted in Uncategorized on July 8, 2013 by writer. The stigma of construction is very similar to that of the auto repair industry: the job always takes longer than they expect it to and is always more expensive than the original quote. While you can’t always foresee certain obstacles to construction, you can enlist the help of a trustworthy and reputable Houston electrical remodeling company. Highlights Electrical has been serving the greater Houston area for over 25 years. We work on residential projects with the same dedication that we work on commercial electrical remodeling jobs. Call (713) 266-6464 to speak with a friendly member of our team about your electrical remodeling project. A Houston Electrical Remodeling Company that Works with your Schedule! Electrical construction and retrofitting is usually done in conjunction with a remodeling project. The Highlights team has always been very mindful of construction schedules and works hard to make sure that we are not the ones who are holding the remodeling project behind. Our extensive experience and certified technicians allow us to work with extreme efficiency throughout the remodeling process. Another strong point about the Highlights team is that we are not shy about telling you the status of a project. If we have run into unexpected difficulties and obstacles that may cause project delays, we will tell you immediately. Trust and communication with our client is extremely important to us and we firmly believe that keeping our clients “in the loop” makes the remodeling project go along more smoothly as a whole. Not only do we implement all of these qualities within our own team, but the Highlights team also makes sure to work with general contractors and architects to ensure that our project meets both the aesthetic and practical needs of our client. We believe that collaboration with other construction teams is the only way to design and build a solid remodel. From build outs to complete renovations, Highlights Electrical is a Houston electrical remodeling company that you can trust with your project. Don’t get stuck with an unexpectedly large invoice — call (713) 266-6464 for a consultation. This entry was posted in Electrical Construction and tagged commercial remodeling, electrical construction, electrical remodeling, home remodeling, remodeling on June 28, 2013 by writer. Highlights Electrical is an electrical construction company from Houston, TX. We have grown with this city and understand that the demand for energy is expanding at an exponential rate. For this reason, Highlights Electrical emphasizes energy efficient lighting and power solutions for commercial and industrial infrastructure. Lets look at some of the sustainable and cost-efficient options that we offer as professional electrical construction contractors. We design and install lighting systems from the ground up. Our technicians are also trained to follow all of the municipal regulations so we can ensure that your building is up to code with just one simple inspection. Local businesses frequently hire an electrical construction contrator from Highlights to perform basic maintenance on their lighting system. Our lighting services apply to the outside too, including parking lots, business signs, and light poles. In terms of energy efficient options, we specialize in LED lighting systems and turn-key access lighting. If you would like to change your current lighting system for a more cost-efficient system, we can offer you professional retrofitting services at a rebated cost. Electrical systems extend well beyond lighting. Each electrical construction contractor on our team is trained in designing and installing an electrical system from the ground up. We also provide maintenance and repairs on almost all electrical systems. Looking to remodel? No problem! We will make sure to keep as much of your existing system as possible when remodeling your electrical system. Installing a capacitor bank is a fantastic way to conserve energy. Highlights provides installation and maintenance of many types of capacitor banks. 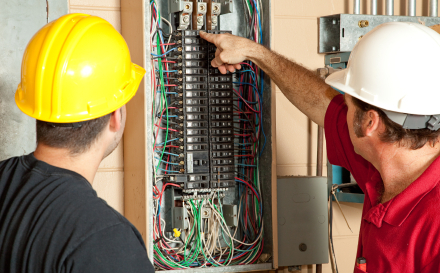 Our team of technicians are highly trained and certified in all fields of electrical services. When you call Highlights Electrical, you know you are speaking to real professionals located in your home town. 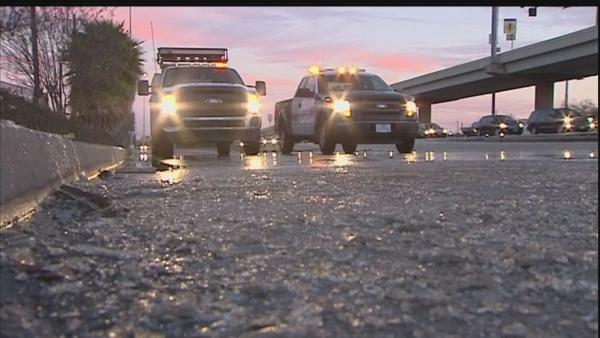 In fact, we are so reliable that the City of Houston has entrusted us to do LED retrofitting for highway underpasses. Let the best electrical construction contractor in Houston light up your home or building. Call (713) 266-6464 for more information. This entry was posted in Electrical Construction, Uncategorized and tagged electrical construction, electrical construction contractor, electrical contracting services, houston on May 15, 2013 by writer. Highlights Electrical is a Houston electrical contracting company that can handle every electrical issue under the sun. Unlike other electrical contracting companies, we can follow through with an electrical construction project from start to finish. We focus on all aspects of electrical system design, installation, construction, and maintenance. Our team of technicians are also trained to handle other projects aside from electrical construction, such as security systems, IT services, and lighting systems. Whatever your issue may be, Highlights is here to diagnose the problem and find the solution. Call (713) 266-6464 for more information about our contracting services. Lighting is our passion. We truly enjoy designing and installing efficient lighting systems that encourage positive moods, productive, and safety. Whether its a parking garage or an entire office building, Highlights has the know-how and experience to create a lighting system that works well with the architecture and the aesthetic of your building. Our expertise also lies in retrofitting lighting systems to bring them up to code and to make them more energy efficient. Highlights offers LED lighting options and can help you find rebated retrofit options, so you can go green and get brighter at the same time. What sets us apart from other Houston electrical contracting companies are the services we provide in addition to our quality electrical and lighting construction. Our highly trained team of technicians can design card access security and camera systems that meet the needs of your building. We also specialize in a voice, data, and fiber optic cabling, which can tremendously enhance the efficiency of your office building. Never worry about a storm again with power generator, UPS, surge suppression, and capacitor bank systems. We provide installation and maintenance of all of our systems. When it comes to picking a Houston electrical contracting company, wouldn’t you prefer only having to go to one for all of your electrical needs? Call Highlights Electrical at (713) 266-6464 to learn what we can do for you! This entry was posted in Electrical Construction on April 24, 2013 by writer. Whether you are remodeling or building from the ground up, quality electrical design and installation is necessary for any construction project. Highlights Electrical is an electrical contracting construction company located in Houston, TX. Put the electrical design and remodeling of your next building in the hands of trained commercial electrical contractors. Houston calls (713) 266-6464 for all electrical construction services! 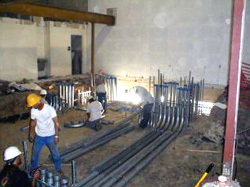 Commercial electrical contractors constructing an electrical system. For over 25 years, we have been providing the Houston area with affordable and efficient electrical construction and maintenance services. We specialize in designing, constructing, and installing electrical systems in commercial buildings. Moreover, we work can also create a comprehensive management system so that you can easily control the energy use in your building. Energy efficient lighting options are available. Looking to turn that empty lot next door into a parking lot for your business? We can design and construct the lighting poles for your parking lots. We are also experienced with lighting design for parking garages. Each office building or commercial building has its own specific lighting needs. Our team designs electrical systems so that energy is optimally distributed. We do much more than electrical and lighting systems design and construction. Highlights also specializes in voice cabling, data cabling, comprehensive energy analysis, power factor correction, energy efficient retrofitting, fiber optic cable installations, card access security systems, and generator installation and maintenance. When it comes to devising creative solution to electrical problems, Houston businesses call Highlights Electrical. We love coming up with new ways to improve the lighting in your office building while simultaneously cutting energy costs. Turnkey lighting solutions as well as revolutionary LED lighting systems are some of our specialities. 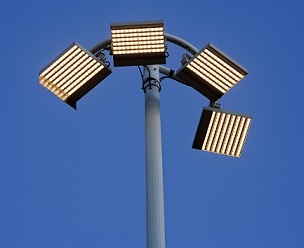 We also provide Houston businesses with affordable maintenance of hard to reach lights, such as signs and light poles. When it comes to commercial electrical contractors Houston chooses Highlights. Call Highlights Electrical at (713) 266-6464 for all of your electrical repairs, maintenance, and construction projects. This entry was posted in Uncategorized on April 17, 2013 by writer.